"A wonderful adventurous holiday with scenic trekking and peak climbing up to [6,249 meters/20,502ft], technically not so difficult peak, we are available to grant you 21 days making avail full packaged service"
Larkye Peak is not technically difficult to climb, who are in quest for exhilarating climbing, if they are well acclimatized and good level of physical fitness, can obviously make it. The simple reason; we have a very professional guide in mountaineering who are particularly experienced in Larkye peak climbing, very well specialist informants about weather forecast and caring personals as your climbing guide. We Himalayan Diamond Adventure provide you really truly gears the the Union of International Alpinist Association (UIAA) tested gears one and enough climbing grouping equipments and gears. Apart from this, such climbing highly requires your physical fitness and climbing gears placing knowledge, that’s on your hand.The Larkye peak climbing activity can combine with the Manaslu Circuit Trek. It offers a satisfying climbing with zenith view of Manaslu and many others several mountain views. Larkye Peak is a moderate technical difficult peak to climb among them trekking peaks in Nepal. The Larkye peak climbing activity can combine with the Manasalu Circuit Trek. 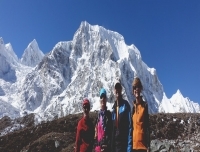 It offers a satisfying climbing with zenith view of Manaslu and many others several mountain views. 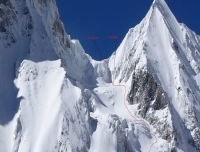 There is lot confusion however about which peak it is and groups are often lead up a steep line to a subsidiary peak known as Sano (small) Larkye [5,807 meters/19,051ft]. Base camp is close to the Larkya La, a pass of 5,106 meters (16,7052ft). Sano Larkye Peak can be climbed in a long day from this base camp. However, to climb Thulo (big) Larkye 6,249 meters (20,502ft), a high camp is needed. Larkye Peak offers you to go over a recently opened motor off road by the government of Nepal in the Manaslu region. The journey rewards us with the pristine natural beauty along with the combination of rich culture and diverse biological diversity. It is the trail along the mystical land of the diversified culture and ravishing bio-diversity. Considered to be the great option for the ones who desire the thrill of a demanding climb, Larkye Peak Climbing is a fantastic trip through ethnic villages offering your insight upon their uniqueness culture and warm hospitality. Located in the western part of Nepal in the Gorkha District, Larkye Peak climbing is a vigorous journey to complete. Larkye Peak climbing starts with a scenic drive to Arughat – Soti khola towards Machhi khola, from Kathmandu. The trail follows the Budhi gandaki canyon valley and crosses many peaceful isolated villages like Jagat, Philim, Namrung, Samagaon, and Samdo on the way. We will also cross many green lush forests with the views of high mountains on our way. The local villages on the way offer us to explore their culture and customs, monasteries, fluttering prayer flags, the prayer wheel, and prayer walls. On summiting the Larkye peak the splendid views of the high mountains renders the trek to be enthralling and unforgettable. As Larkye Peak is one of the least climbed the peaks in Nepal, mountaineers and adventure seekers fancy the journey to the peak to quench their thirst for the adrenaline rush and exhilarating climb. The trail, being difficult and challenging, one needs the good level of fitness with earlier mountain climbing experience. The peak climbing journey takes you through villages with massive Buddhist faith and Tibetan-influenced culture to the top of a magnificent peak in the Manaslu region all the while never failing to amaze you with the rich bio-diversity in the route along the trek. Day 01: Arrival in Kathmandu [1,350 meters/4,429ft), transfer to Hotel. Day 03: Trek to Khorlabesi [970 meters/3,182ft], 7 to 8 hours. Day 4: Trek to Jagat [1,340 meters/4,396ft], 7 to 8 hours. Day 05: Trek to Philim [1,570 meters/5,151ft], 3 hours. Day 06: Trek to Bihi phedi [1,990 meters/6,529ft], 7 hours. Day 07: Trek to Namrung village [2,630 meters/8,628ft], 6 hours. Day 08: Trek to Syala village [3,500 meters/11,483ft], 7 to 8hrs. Day 09: Hike to Pung Gyen gompa [4,000m/13,123ft], and Samagau [3,520m/11,546ft]. Day 10: Trek to Samdo [3,875 meters/12,713ft] 3 to 4 hours. Day 11: Trek to Dharmasala [4,460 meters/14,632ft], 4 hours. Day: 12 Hike to Larkye base camp [5,060 meters/16,601ft], 4 hours. Day 13- 16: North Larkye summit [6,249 meters/20,502ft], and back to base camp. Day 17: Larkye Pass [5,106m/16,752ft], 5 hours of walk Vim thang [3,590m/11,778ft] 4hrs. Day 18: Trek to Dharapani [1,963 meters/6,440ft], 9 hours. Day 19: Drive to Besisahar and Kathmandu [1,350 meters/4,429ft], 11 hours. Day 20: Finally, the Departure. Welcome to the land of white glowing mountains. Before your landing in Kathmandu at Tribhuvan International Airport, the representative from Himalayan Diamond Adventure will have reached there to welcome you. After landing your aircraft, we pick you up with our welcome greetings. Collecting your luggage, we drop you off to Hotel. You will have welcome dinner in Nepali cultural restaurant with your guide’s briefing about the day program tomorrow. The hotel service includes bed and breakfast. Our guide will come in your Hotel about at 07:00 A.M. to pick you up to the bus station in Kathmandu then leave for Arughat, Soti khola today. We will have a scenic bus journey approximately 11 hours to Soti khola from the station, Ganggabu,Kathmandu in local deluxe bus. You will find an already booked (by the company) Lodge in Soti khola, where you spend overnight at lodge included dinner and breakfast with cup of tea or coffee. The road passes with fascinating ground, landscape and Mountain terrain views, of major peaks, Manaslu, Ngadi Chuli, Himalachuli, Rani peak, Baudha Himal and Ganesh Himal . Overnight in lodge. Depart from Soti khola we will pass, many cultivated lands, hamlet, tributaries, well made bridges, beautiful Sal forest before get in Khorlabesi 970 meters (3,182ft), It’s at bank of two rivers. Today we trek 7 to 8 hours to reach our lodge and trail climbs onto a ridge above huge rapids on the Buddhi gandaki River, treks rocky vertical walls following Buddhi gandaki up River. Along the way the trail weaves its way up and down many. We spend overnight in lodge included dinner and breakfast with cup of tea or coffee. Leaving of Khorla besi we trek into the gigantic gorge the track moves through Tatopani (hot spring) crossing the Buddhi gandaki River twice and others side rivers of Buddhi gandaki. Finally, we reach to Jagat 7 to 8 hours of continue gentle uphill walk along the rugged trail, and passing many scattered hamlets, bridges and tributaries with beautiful scenery. We stay at lodge included dinner and breakfast with cup of tea or coffee. Today we will make a pleasant trip, the trail gradually ascents up following the Buddhi gandaki up River and crossing the Buddhi gandaki River with captivating view of Sringi Himal, Gurungs inhabited settlements and cultivated the farmer’s farmlands. Underneath Phillim village, we cross well made suspension bridge over Budhi gandaki River, and then trail short climbs to Phillim village. Where the trek ends of the day? We spend overnight in lodge included dinner and lunch with hot drink service. After breakfast, our trek starts to Bihi phedi, the trail moves towards to new bridge and then Dang village . After crossing the bridge over Budhi gandaki River, we trek into the huge Gorge and shady woods and bamboo forest more gently way up. Finally we cross again Budhi gandaki River along the bridge then trail steeply rises up for short walk uphill. Lastly our track turns on easy way to reach Bihi phedi. We stay overnight at Tea house included dinner and breakfast with cup of tea or coffee. Head out trip to Namrung the trail moves straight towards to the Prok and Gap villages through Tibetan Sherpa cultivated farmlands, crossing the suspension brides and cliff canyon way. We stop in Gab T-house for hot lunch and for refreshment. And then our trail moves towards gentle uphill, under the green lush forest to Namrung village. Later than 6 hours of exhilarating walk reach to Namrung lodge from Bihi phedi lodge. Today there is facilities of WIFI service and lean and more comfortable bed. We spend overnight in lodge included dinner and breakfast with cup of tea or coffee. Today we trek to Syala village throughout Tibetan Buddhist villages, Mani walls, prayer stones, fluttering prayer flags, Monasteries, the farmer’s cultivated lands and lodges, whole the day Mount Manasalu is dominating all landscape. Today we exploring local inhabitant’s their unique culture, typical lifestyle. After walking off 6 to 7 hours continue more gently up way along the natural trail we reach to Syala village, which one is blessed by Pinacle Mt. Manaslu. There is local people promoting more beautiful lodges. Syala is became more touristic place beause of its naturally beauty. Where is more possibly tourist destination in this remote area with the superb Mt Manasalu view? Today, we spend overnight in lodge included dinner and breakfast with cup of tea or coffee. Pung Gyen gompa or Gung Gyen glacier valley is fabulous for side trip and an acclimatization in Manasalu round trek. The Pung Gyen gompa is above Pung Gyen glacier and lap of Mt Manasalu and Mt Ngadichuli peak 29. It’s summer Yaks and horses grazing land, where is a small monastery. It’s belonging to lord Milarepa. After spending some wonderful moment in this paradise we trek down to Samagau. Sama gau is also carrying more possible tourist destination in this remote valley with the captivating Mt Manasalu view. Today we stay in lodge including dinner and breakfast with hot drink service. Trek to Samdo [3,875 meters/12,713ft], the trail more gently ascents up with unusual landscape following upstream Buddhi gandaki and crossing side Rivers of Budhi gandaki. The track moves towards through Juniper, rhododendron, blue pine forest, Yaks pastureland. Finally, we cross a small bride over the Budhi gandaki River and climb uphill trail with strenuous for the short distance to reach Samdo village. Its located in the superb fine place, way to border of Tibet and Larkye pass. We spend overnight in lodge included dinner and breakfast with cup of tea or coffee. Leaving to Dharmasala, we will cross side River of Buddhi gandaki, it source from way up Tibet. The trail gently ascends up to Larkye pass – Dharmasala, separating way of Tibet border. The track moves to towards passing wilderness places, old Mani walls, Chortens and huge summer Yak grazing lands with magnificent view of Samdo peak backwards of us. We probably see snow leopard and the blue sheep is can be seen very commonly on the way up today. After walking 4 hours continue gently up way we reach Dharmasala. We spend night at tented tea house included dinner and breakfast with cup of tea. It will take approximately 3 hours to reach Larkye base camp from Dharmasala T-house. Departure of Dharmasala our trail gently rises up throughout rugged lands, moraine and snowbound field with visible of Manaslu and Larkye peaks, the landscape is awesome today. We stay at tented camp including lunch, dinner and breakfast service with hot drink service like tea, coffee. The period of climbing’ we instruct you mountaineering skills, such as Jummering (ascending) Repelling or up sailing (descending) and proper safety placement. We hike to high camp to open track and for proper acclimatization. Before, attempt summit, and later than we ensure your good level of fitness and weather forecast. If the weather is fair on summit day, we wake up about 12:00 at mid night for tea and breakfast, and then we start to traverse onto moraine an hour with lightning at dawn and then get up via 15 to 90 degree’s vertical snow slopes. We climb most of time with support of guide rope and very few hour we climb it with support of fix line ropes on this snow slopes. The reward at the summit is one of the world’s most spectacular mountain views you will ever experience. We will then make our way down. We spend the overnight at tented camp including lunch, dinner and breakfast with hot drink service. Today, we wake up at 07:30 AM. After having breakfast, we set off our continue trip to Vimthang. After a short walk of uphill trail, along the moraine, with towering snow capped mountain views, we reach to Larkye pass [5,106 meters/16,752ft]. It’s difficult to make pass with chilled wind, moraine and glacier traverse. Whatever the landscape is awesome. The pass offers us mesmerizing view of Kanggaru Himalaya, Gyajungkhang, Himlung, Ratna chuli and Cheo around circular Mountain View. From the Larkye pass the trail steeply descents to Vimthang. After 4 – 5 hours of walk downhill through rough trail we reach Vimthang lodge. We spend overnight in lodge; it includes dinner and breakfast with cup of tea or coffee. Leaving from Vim thang the trail several times descents downhill through the rhododendron, pine, bamboo forest, pasturelands, the farmer’s cultivated farmlands, lodges and following downstream Dudha khola. The period of downhill walk, we can have a wonderful natural trip before come on busy Annapurna trail. After 4 hours of downhill trek, reach Guwa village. We stop there for an hour for delicious meal and refreshment, later then again’ we trek downhill to Dharapani through Tilche Gurung, Magar and Thakali people settled village. After incomparable Manasalu circular trek and including Larkye peak climbing, today we drive back to Kathmandu. Today 10 – 11 hour drive from Dharapani to Kathmandu in Jeep and tourist bus. Overnight in tourist standard Hotel included breakfast service. We drop you in Tribhuwan International Airport at terminal room in your flight checking time by tourist Bus or Car and says bye. Kathmandu/Arughat – Soti Khola or towards Jeep or tourist bus, depend on group size. Entry permits: Peak permit/ Manasalu special permit/ MCAP/ACAP. All necessary trekking, peak permits and garbage management. Transportations:- Jeep service Dharapani Bisishahar and Tourist Bus Besisahar Kathmandu. License holder, English speaking, experienced and helpful guide with all his salary, food, drinks, accommodation and Transport. We have available of personal climbing gears, Harness, Helmet, Jumer, Crampon, Ice, boots, Figure of 8 (Pay extra at reasonable price). Nepali staff’s, insurance policy covered it, Emergency rescue evacuation, medical treatment and accidental. Down Jacket (-12*C) and Sleeping bag (-20*C) (Pay extra $1 and 50 cents each item per day). Company's complimentary Duffle bag, Map and Company T-short. Personal climbing equipment and gear like Harness, Alpine boots, Crampon, Helmet, normal Ice axe, safety ropes, Lock and open get carabineers. Your personal expenses like; Hot shower, Laundry, Battery charging, telephone and WIFI - Internet service etc. 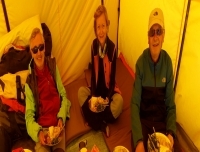 Climb peak with mountain leaders and with comprehensive service. 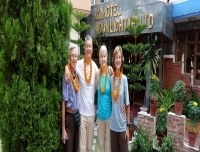 We Himalayan Diamond Adventure render you 3 stars standard hotel in Kathmandu for 3 overnights with breakfast service. To reach base camp of Larkye, we will have a Scenic bus journey Kathmandu to Aruhgat – Machhi Khola. Trail passes through beautiful isolate Buddhist faith and Tibetan-influenced culture villages, with stunning Mountain View. After 7 days of fabulous hike, reach the Base Camp. For the period of trekking we stay in lodges and on base camp in tent. It’s biologically and culturally rich. The Sama gau is most popular for trekkers or climbers in this Manasalu region. The Larkye Peak is really satisfying climbable peak in the Manaslu trekking route. The Manaslu Larke pass trekking and Peak climbing offers the lifetime climbing experience; feeling of exhilarating, to be at top of the peak. It needs well acclimatized party, good level of physical fitness and minimum 20 days of holiday to make a accomplish. Before going to summit, we instruct you lot for the climbing knowledge. You are not well equipped for the trip; you can hire the gears with us in reasonable price. We Himalayan Diamond Adventure provide you truly gears the Union of International Alpinist Association (UIAA) tested one, such as Lasportiva Climbing boot, Black Diamond:- Helmet, harness, Ice axe, Crampoon, Carabineers or Grivel and Petzel too. 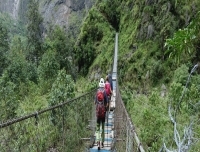 After peak climbing and Manasalu round trip, we come to the most popular Annapurna trail. Larkye Peak is not technically difficult to climb, who are in quest for exhilarating climbing, if they are well acclimatized and good level of physical fitness, can obviously make it. The simple reason; we have a very professional guide in mountaineering who are particularly experienced in Larkye peak climbing, very well specialist informants about weather forecast and caring personals as your climbing guide. We Himalayan Diamond Adventure provide you really truly gears the Union of International Alpinit Association (UIAA) tested one and enough climbing grouping equipments and gears. Apart from this, such climbing highly requires your physical fitness and climbing gears placing knowledge, that’s on your hand. More a less, it’s technically difficult to climb, but who are in quest for thrilling climbing, if they are well acclimatized and physically fit, can obviously make it. The simple reason; we have a very professional guide in mountaineering who are highly experienced in Larkye peak climbing, very well practiced informants about weather forecast and caring personals as your climbing guide. 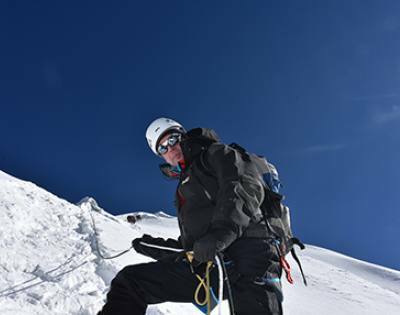 We Himalayan Diamond Adventure provide you really truly gears the Union of International Alpinist Association (UIAA) tested one and enough climbing grouping equipments and gears. Apart from this, such climbing highly requires your physical fitness and climbing gears placing knowledge, that’s on your hand. We set up a permanent base camp for as long as the expedition continues. Each of the members has a personal North- face VE 24 dome tent with water proof compact mat. We provide a carpeted, heated dining hall with luxurious arm chairs and clean fascinating table with solar electricity light make your stay at base camp as luxurious. We have a toilet tent; all is in perfectly hygienic condition and order. We provide sufficient and tasty hygienically prepared food at both base Camp and High Camp during peak climbing. Plenty of high altitude food is provided at higher camps. The guide instructs you lot in Larkye peak base camp time, before head over summit. The guide tips you very important climbing techniques, like glacier travel; walk on ladder skills, Active rappelling (Up sailing), and Safety placement, proper arrange of gears and equipments while climbing and use of proper climbing gears. The climbing gears are super expensive, so why you spend lots money for once time use? You can have climbing gears on hire from us with reasonable price. The rental gears are branded of Black Diamond, Lasportiva, Grivel, and Petzl. We Himalayan Diamond Adventure highly recommend you the Union of International Alpinist Association (UIAA) tested gears one for safe and comfortable climbing.